Make a difference for your community—and the planet. Volunteers with Edmonton's Waste Management Utility promote environmental responsibility by helping residents reduce their waste. Note: A Police Information Check may be required for some roles. Master Composter Recycler volunteers are Edmonton's waste reduction experts. They volunteer by teaching friends, family, neighbours and co-workers about sustainable waste habits. This is a "learn and serve" volunteer program, offered annually. Volunteers complete 40 hours of free training, followed by at least 35 hours of volunteering. 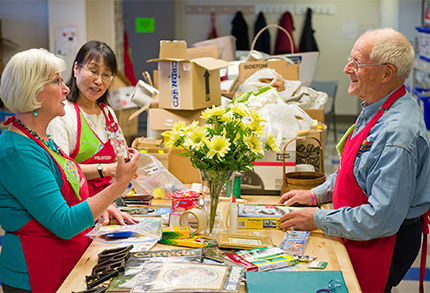 The Reuse Centre accepts various items from Edmonton residents free of charge and makes them available to organizations and individuals for use. Many items are not accepted for reuse elsewhere. Volunteers are essential to the Reuse Centre. They promote reuse, educate Edmontonians and help sort donations. Individual and group positions are available year round.